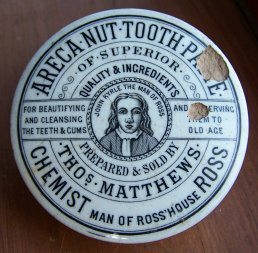 Thomas Matthews took over Thomas Roper's Chemists business in Man of Ross House in around 1876. He was then succeeded by J.H.Hart in around 1914 then by 1933 the business was being run by J.F.Hart (which was presumably a son of J.H.Hart). 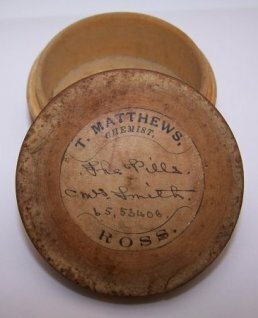 The following are some examples of T. Matthews pots and labels. CHEMIST MAN OF ROSS'HOUSE ROSS.